Subjects, styles, advertising, other relevant information: In the 1939 Register Jack was shown as an apprentice photographer at the above address with his parents: Richard L Read police sergeant b: 30/6/1895 and Bessie L Read b: Nov 1893. Against Jack's entry was written 750934 AC2 Read JD Photo Sect Sq3 RAF ?Shawel?, suggesting WW2 military service in photography in the RAF. By around 1949 Jack was the manager of the University Cameras Developing and Printing Works, initially operating from sheds in Searle Street Cambridge, later in premises in Bridge Street Cambridge under the bookbinding works of Stoakley and Son. Later University Cameras started a colour d and p works called Fencolour. Tom Johnson recalls Jack Read but does not believe he continued into colour work. References: 1939 Register. Personal recollection of Tom Johnson. Lilian was one of the most prolific and important photographers listed on this site. The grand-daughter of William Pratt of Hill House West Walton, Norfolk, daughter of John Thomas Pratt. Lilian Pratt married Sydney Ream, son of Fosbrook Ream of Maltby's Farm Fridaybridge in 1905. Lilian was the pupil of A. Drysdale, whose studio was in the house later occupied by CD Palmer on Lynn Road, Wisbech. That studio was first opened by Valentine Blanchard and as time passed the business changed hands, first to John Hinley and then A Drysdale became purchasers. After Lilian had been a pupil for some time, Hardingham Mehew and Leonard Smith secured it. Lilian afterwards worked for John Kennerell who occupied Borough Studios, first as a pupil, then assistant and finally manageress. After a while Lilian became a partner and the firm's name became Brown and Ream. 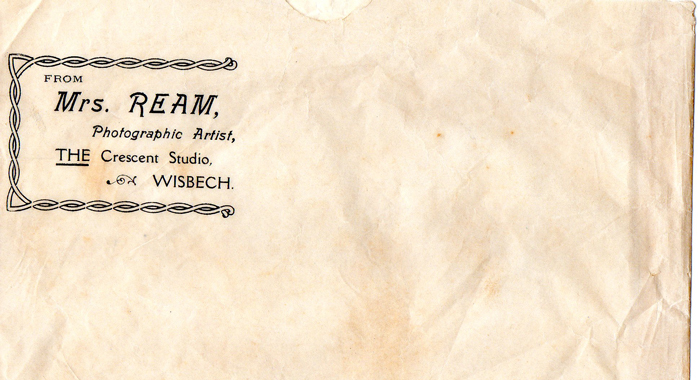 In 1909 Lilian had the Crescent Studio erected in The Crescent Wisbech (4 The Crescent was her family home). She also purchased the business on Lynn Road where Smith became the assistant. Later she purchased Jasper Wright's business in Alexander Road, but used the premises more as a showroom than studio. In 1921 she took over the lease of Borough Studios and described herself as “Portraitist and Gallery of Arts and Crafts". She also opened a showroom in Market Street, but in 1921 when she acquired the Borough Studio on the retirement of JL Brown this was discarded as no longer necessary. 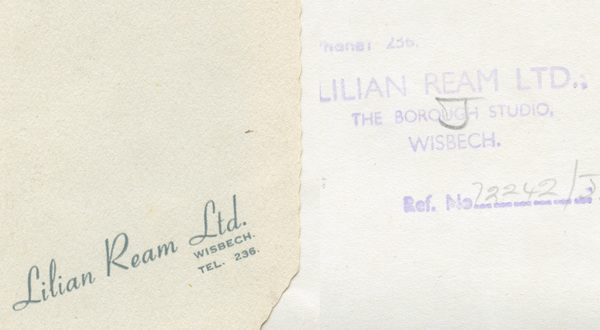 In 1932 it is believed that Lilian purchased the business of the Imperial Photo Company, then newly established in Wisbech. 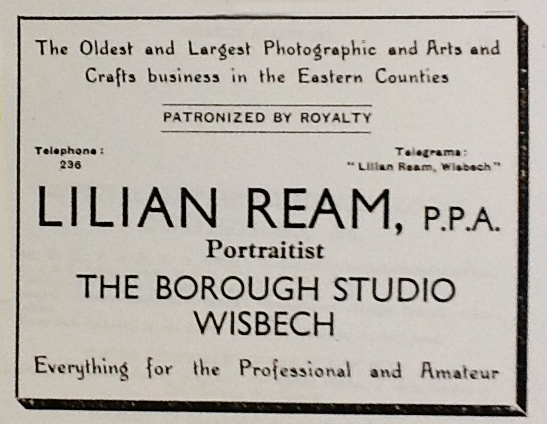 Lilian Ream was the foremost photographer in Wisbech in her time, taking over her competitors. She was also the official photographer for the Wisbech Standard newspaper. 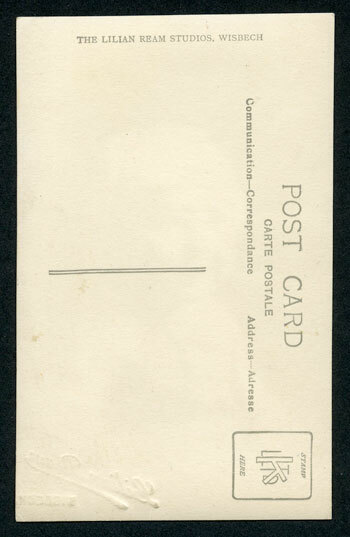 In addition to portraiture, commercial and press photography, Lilian Ream produced postcards, an example of which is below. She retired in 1949 and her son, John Roland F Ream, continued the business, which finally closed in 1971. A meeting to liquidate Lilian Ream Ltd took place on 14th July 1971. Lilian died in 1961. Cambridgeshire Libraries have an extensive collection (100,000) of Lilian’s negatives, including around 15,000 from earlier Wisbech photographers. This is the largest component of the extensive collection of photographic negatives held by the Cambridgeshire collection. Prior to the purchase by the library a large number of negatives were removed from the shop where they were stored, without the permission of the Ream family. Some of these are still in private hands. The Lilian Ream collection of negatives are currently at the Central Library Cambridge, part of the Cambridgeshire Collection. 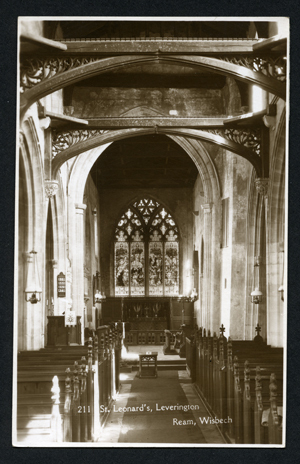 Below is an example sepia real photo postcard of St Leonards Church Leverington, from the Ream Studio - the reverse has no publisher's details and no stamp box. 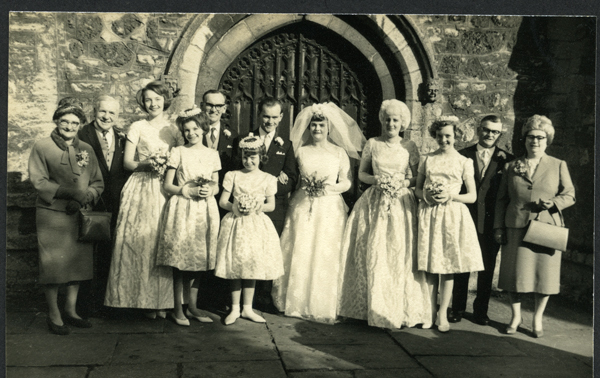 Also below is a wedding group by Lilian Ream Ltd, unknown family, 1950s, below which is the design of a wrap round card mount supplied with the wedding photo and details of the studio backstamp from the reverse of the photograph. 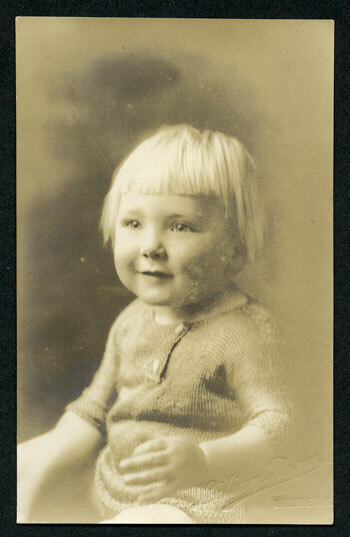 Below this is a portrait of an unknown child printed on postcard stock on the reverse of which is printed "The Lilian Ream Studios, Wisbech". The face of the portrait has an impressed "Lilian Ream Wisbech" in the bottom right hand corner made with a hand embossing press. 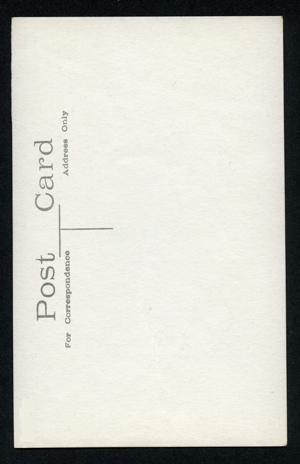 Below this is an unusual survival - a personalised envelope with Lilian Ream's details (Michael Brown Collection). Wisbech Standard 24/8/1923 P5 for a biography under the title "Business Heads"
Subjects, styles, advertising, other relevant information: In the 1939 Register Eilian is listed as a professional photographer, she was single living with her parents at the above address. Her parents were: Clifford N Redgwell b: 1883 an electrical and machinist engineer and Minnie L Redgwell b: 1884. Subjects, styles, advertising, other relevant information: Z Reed has a single entry in a local directory for 1907. 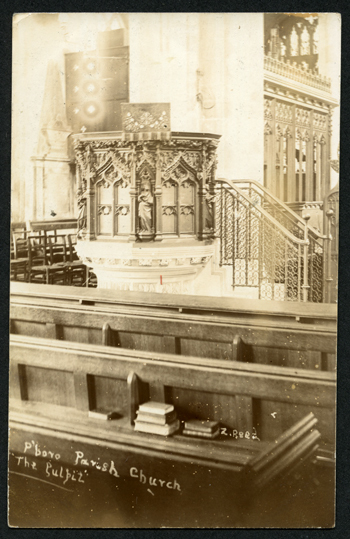 See below real photograph postcard of the pulpit of Peterborough Parish Church (St Johns on Cathedral Square) - titling and photographer's name in rather shaky handwriting on face of card. No trace found in census returns for 1911. There was a Zachariah Reed b:1883 Peterborough, living at 63 Eastgate Peterborough in 1901 - he was a "railway wagon greaser" - but there is nothing other than the unusual first name to link him with this photographer. Subjects, styles, advertising, other relevant information: In the 1901 census Lewis was an apprentice photographer boarding in Blackfriars Street Kings Lynn. In the 1911 census Lewis was listed as a photographer working from home on his own accoiunt at the above address. He was living with his parents; James b:1855 Terrington St Clement fruit grower and Annie b: 1857 Terrington St John. Also at the same address were Lewis's two younger sisters and a younger brother. Robert Pols suggests that Reeve was an apprentice to Jasper James Wright of Kings Lynn. References: Kellys Cambridge Directory 1974, 1975, 1980 Cambridge Yellow Pages Reeve Photography (Cambridge) Ltd, 1981, 1982, 1983, 1984, 1985, 1990, 1995, 1997, 1998, 2000. Peterborough Yellow Pages 1980. B.W. 20 Sept 1990. Cambridge Evening News 26 October 1982.reported on the opening of their studio at Denny Industrial Centre Waterbeach. then listed as "Regent Studio (Starr & Rignall) 85 Regent Street"
Below is a portrait of Peggy Elizabeth Flack (married name Bond) b:1923 in Southery Norfolk, taken at Regent Studio sometime during World War 2 when she was working in the Catering Staff of Addenbrooke's Hospital. 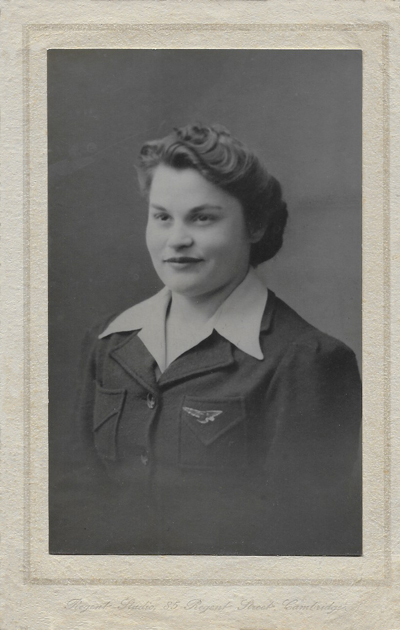 The photograph has been reproduced with the permission of Peggy's son, Alan Bond, who states "The photo is a bit of mystery as she seems to wear a tunic jacket with some form of wings emblem but we have no knowledge of any air force connection. My grandmother had a similar photo of my mother's younger sister wearing the same type of jacket, so it may have been a studio prop." Any information on the badge and tunic would be much appreciated. Below the portrait is a more detailed view of the studio details on the mount. Subjects, styles, advertising, other relevant information: MBBS Edinburgh University graduating in 1905, Douglas Reid was appointed as a demonstrator at the Cambridge University School of Anatomy in 1910. He was devoted to his work and the author of several medical books. In 1934 he lost his job due to a change in the rules of the University and suffering from depression over this and his financial situation he committed suicide. References: Report on inquest The Scotsman 3 Nov 1934 p16. Guide to the CAS Survey by Mike Petty. Guide to the CAS Survey negatives in the Cambridgeshire Collection. UK Medical Registers 1911, 1923, 1927, 1931. Subjects, styles, advertising, other relevant information: There are a few references to Ivy Reynolds in the Norris Museum Collection. 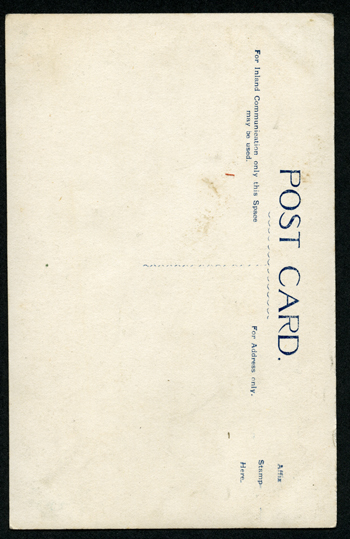 PH/S.IVE/Broad.L/5 is the photograph of the interior of a house called Rheola in Broadway, St Ives. The photograph is signed by the photographer Ivy Reynolds of Woodhurst. Another image of the same property by the same photographer is: PH/S.IVE/Broad.L/6. PH/WDHUR/12 is a photo of the artist in the 1920s donated by Mrs Eva Shaw. Notes suggest that Ivy Reynolds, artist, lived at Woodhurst where her father Frank Reynolds was a grocer and Draper (1920 Kellys Directory) The Norris Musum catalogue suggests that Ivy may have worked for photographer Lilian Ream - which appears to be based on a photo of Ivy in their collection, impressed with the name of Lilian Ream's Studio. PH/HOUGH/42 is a photograph by Ivy Reynolds in the 1920s of a four poster bed at Dr Martin’s house at Houghton.